In April of 2013 a curious diary began appearing on various internet sites discussing the paranormal. The diary was written by Héctor Álvarez, a park ranger at the Mapimí Biosphere Reserve, a UNESCO-designated protected area found near the intersections of three northern Mexican states: Durango, Chihuahua and Coahuila. 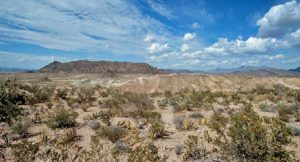 Located in the Chihuahuan Desert, the biosphere encompasses over 1,300 square miles of rugged terrain and contains the habitat of many different types of animals ranging from the puma and mule deer to the desert tortoise and the sandhill crane. The latter bird species calls Mapimí home because of the large salt lake found within the biosphere preserve. Additionally, there exist over 400 different types of plant species within the confines of the park. The diary of Héctor Álvarez did not detail anything about the stark but beautiful natural landscape of the author’s workplace, however. It was written, presumably, to document what the ranger was experiencing while working the graveyard shift at the reserve. According to the diary, Álvarez reported to his superiors what he had been experiencing and they paid no attention to his reports so he decided to document things in his own handwritten accounts. The diary is full of strange encounters and unexplained occurrences. Álvarez wrote mostly of the unexplained lights he saw in the desert sky. While the park ranger saw his share of glowing orbs, he wrote most details about the flying colorful triangles he saw above the biosphere reserve. They measured about 6 feet across with colorful, prismatic borders that appeared to be on fire. The inside area of the triangles had shifting patterns of color that seemed to him to be an attempt at communication. Sometimes the triangles would appear alone or sometimes in groups of three. Álvarez tried taking photos of these flying triangles but each time he tried, his camera malfunctioned. In addition to the UFOs, the young park ranger also wrote about something bizarre that happened to all of the research station’s computers one night. The speakers on the computers blared a strange white noise, even those which did not have their power turned on. Immediately after this incident, the computers were no longer functioning. In the morning when a technician came in to try to fix the computers, he noted that all the motherboards appeared to have been subjected to high amounts of heat or radiation and were not fixable. Other diary entries mentioned paint patches changing colors on the walls of the facility, sometimes in triangle patterns. The diary entries ended on March 15, 2013. This was the last day anyone saw Héctor Álvarez. It was a mystery as to where he went as his car was still in the parking lot of the main facility of the reserve. He was never seen again. A part of the Mapimí Biosphere Reserve has been christened La Zona del Silencio – or “The Zone of Silence” in English – and has drawn researchers and curiosity seekers for years. The first reports of anomalies and bizarre things happening in this area became public in the 1930s. Famous Mexican aviation pioneer Francisco Sarabia Tinoco claimed that when he flew his plane, nicknamed Conquistador del Cielo, over the area of this part of the desert his radio would not work and his instruments would go crazy. Magnetic anomalies and electronic equipment malfunctions have been reported from Sarabia’s time to the present day across this Zone of Silence. Some say that the mysterious properties of this region caused a US missile to crash here in July of 1970. The Athena test missile was fired from a US military base near Green River, Utah, with its ultimate destination being White Sands Missile Range in southern New Mexico. The missile never made it to White Sands but went hundreds of miles off course and impacted the earth in the Zone of Silence a few miles from where the biosphere reserve’s research station now stands. Although many local ranchers saw the flash of light and heard the noise of the wayward missile, it took the Americans weeks to find it in the desert expanse. In the meantime a group of locals had found it and watched over the crashed remains and when the Americans finally came, they participated in the extraction and clean-up efforts. Supposedly the missile had contained radioactive material and because great fuss had been made in its retrieval and the decontamination of the area that followed, locals got together to see how they could best exploit this incident to try to bring tourists to the region. 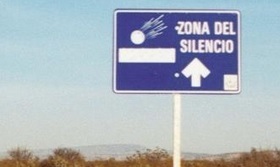 It was then when the “Zone of Silence” got its official name and the world became aware of the strangeness of the area through local press stories that were picked up by international news media. According to the locals, the strange magnetic anomalies and atmospheric conditions of the Zona cause vortexes to be formed that stretch up through the upper atmosphere and out into space, thus drawing in everything from missiles to meteors to extraterrestrial craft. A year before the American missile mishap what was later known as the Allende Meteorite crashed into an area near the zone. For years locals have claimed that the Zone causes pretty much anything to fall from the sky and cite the many examples of meteorites found on the desert floor throughout the region. The claims of the weird atmospheric and magnetic conditions are also accompanied by local claims of observed mutations in flora and fauna, such as tortoise shells found in the shape of triangles and coyotes that grow to twice their normal sizes. Also, cactus has been found to change into strange colors, which has been substantiated by photographic proof. Could these natural aberrations be the result of radiation leaked from the American missile crash back in 1970? 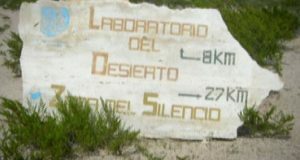 In the late ‘70s when the biosphere research center was being built after the reserve had been declared a protected area by the Mexican government, rumors began to surface about the true intentions behind the creation of the reserve and the building of the facilities within the Zone. Locals claimed that NASA had constructed a secret scientific research center there not only to investigate the atmospheric and magnetic anomalies, but to study and communicate with possible extraterrestrials. The water tower near the main building of the park’s welcome center, the locals contended, was really a secret observatory. The supposed vortices found within the Zone of Silence, it is claimed, can be used to contact intelligences from other worlds and other dimensions. The alleged alien connection to the area has been supported by dozens of eyewitness observations of strange lights in the sky, like the mysterious triangles of the Álvarez diaries, and by on-the-ground encounters with strange beings in the desert. There have been about a half dozen reports of locals and tourists alike having encounters with tall, humanoid beings with long blonde hair and light blue eyes. In the Zone, these beings – always two men and one woman – have asked local ranchers only for water and speak perfect Spanish. In UFO lore, these beings are commonly referred to “The Nordics” and are generally described as a benign race of enlightened beings hailing from the Pleiades, the same star cluster as the nefarious greys, the stereotypically big-eyed, alien-looking race of extraterrestrials who abduct humans and conduct medical experiments on them. The trio of Nordics was once spotted by a scientist from the biosphere research center who had gotten lost while conducting research in the field. Tourists have also reported sighting these beings and always in helping or non-threatening situations. 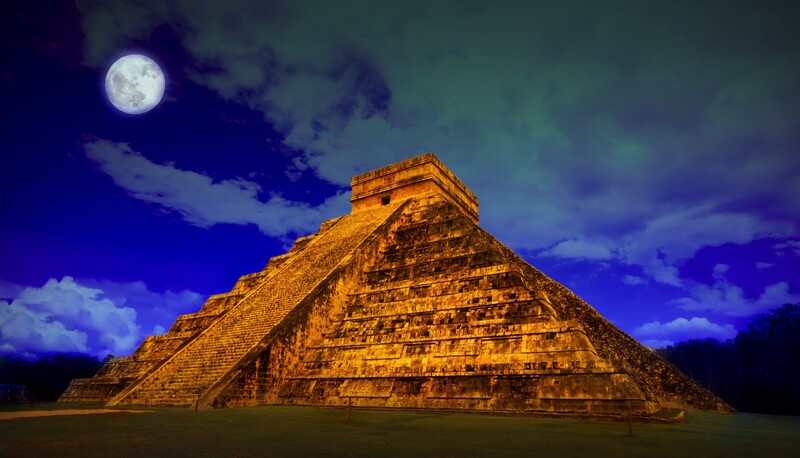 A Mexican New-Age paranormal research group called El Centro de Investigación de Antropología Cosmica de la Escuela Filosofica Lu Men – in English, the Reserch Center for Cosmic Anthropology of the Lu Men School of Philosophy – claims that the Nordics may represent members of what has been called the “Yellow Maya”, the people of the lost civilization of Tulum-Balaam who live below the Mapimí Biosphere Reserve. The small mountains in the Zone of Silence are really pyramids, the group claims, and other natural geological formations are really very ancient ruins. They have named this subterranean civilization “Magneto Tzen” which loosely translates to “The Land of Magnetism.” The Lu Men School of Philosophy people are not the only paranormally inclined individuals to visit the reserve in hopes of experiencing the high strangeness. Since the 1980s various other New Age groups and paranormal researchers from all over the world have held conferences and overnight stays in the Zone in hopes of experiencing something otherworldly. Adding to the overall strangeness, many researchers are quick to point out that the Zone of Silence exists on the same line of latitude on the earth as the Bermuda Triangle, the pyramids of Egypt and the sacred cities of Tibet. 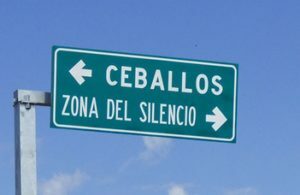 Serious scientific researchers have a hard time pinning down exactly where the boundaries of the Zone of Silence are and the zone seems to shift over time. Many people visiting the area, even for extended periods of time, have experienced no strange activities whatsoever. Claims of increased magnetism, equipment failure and strange atmospheric disturbances have been seemingly difficult to quantify. Most of the serious scientific research in the area has been done in connection to the local flora and fauna and other aspects of preserving the desert environment, at least what has been made public. Locals, for the most part, appreciate the increased tourism and make money off of it, but at the same time the people seeking to experience something supernatural in the Zone of Silence are seen as a bit crazy or somewhat of a nuisance. What is really happening in this area may forever be a mystery or at least remain an open topic for the curious. How close is the nearest lay line? I think it’s pretty close, but not sure. It would be pretty easy to look on a map and plot it. Thanks for listening! Yes a Ley line matrix here? would make an interesting point of reference for these vast anomalies. If indeed there is a cross section within range? – I highly suspect we would find a Ley line \’triangulation Matrix\’- Which would certainly create a very large Vertical Vortex! Explaining its multi-dimensional experiences. This is Definetely worth the exploration and an in depth study!